The pups and mom were hiding in this shed…. possibly for months! Only 2 miles from home, I decided we should get food, a crate, some towels, and flashlights, as the sky was growing dark. 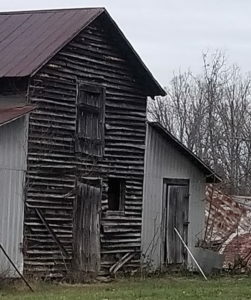 Upon returning to the location, we saw the pups retreated to a dilapidated barn where they most likely had been living. Olivia was gaining the interest of one of the puppies when a curious (and loud) neighborhood boy wandered up. “You trying to catch those dogs?” Our opportunity was ruined. Thankfully he shared that he’d be at work the next day, so he couldn’t “help” us out if we returned. If?? Or course we would return! When we arrived for our second visit, the sky was nearly black (that darn day job that actually pays my bills prevented a daytime rescue attempt). We returned to the barn with hope and found that the puppies decided to seek safety near the home instead. It wasn’t long before we had the white/tan pup between us, but with one missed move, he darted away. Eventually we decided to leave more food and try again the next night. I took one last look at the house when I noticed the brindle puppy cowering near the porch. With great care, I walked in that direction. The frightened pup had cornered himself, allowing me the opportunity to swoop down and pick him up. Baby Bucky was the first puppy captured. He are trying to convince him to leave the crate and join us in the kennel… he was having no part of it! I cautiously returned to the porch to ensure we didn’t have another opportunity to continue the rescue. It became clear, unfortunately, that the screaming puppy had startled his siblings and they hid easily with their mother in the darkness. Our emotions were mixed as we drove home with our brindle rescue pup. We couldn’t help but wonder about those left behind. “Baby Bucky”… for some reason the name rolled out of my mouth. Poor Baby Bucky. After a challenging move from crate to kennel, Bucky took solace in the tiny dog house and wouldn’t come out. When we were out of sight, he would peak cautiously out of the house, eventually abandoning this safety net to eat the food we provided. It didn’t last long, however, and as soon as possible he would retreat back into his cave. We sat with him for hours wondering how we would gain his trust and show him love in his now lonely and unfamiliar world. Two days came and went and I felt terrible that we were unsuccessful in our continued rescue efforts… at least if we had two puppies they would have each other for comfort. I soon realized that to complete this rescue, we would need reinforcements. Don’t miss what happens next…. coming soon! ← Welcome to Happy Tails Blog by APS of Person County! My heart! So glad you are helping them! !